Mixing ingredients for making low-cost cleaning materials for kitchens and toilets. At the time of writing, the group is saving towards the cost of a mixing machine for improved productivity. Transrural plans to provide a matching grant. Three male group members play a key role in the women-led cleaning materials group, doing the heavier handling tasks. 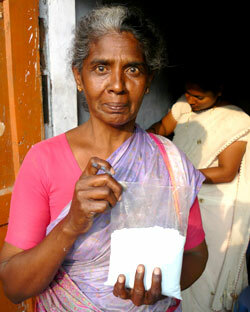 This woman told us how her livelihood has been devastated since the tsunami. She was forced to sell her home to raise cash, and then was reduced to two options for paying the rent – making “beedies”, tobacco rolled up in newspaper, or manually cracking cashew nuts all day long. Joing the materials group not only offers an economic opportunity, but also offers social contact and mutual support. In Kaniyakumari district in Tamil Nadu, as in many districts of India, many people want to enjoy the benefits of a cleaner home environment, yet very few can afford branded cleaning products, promoted by multi-national companies. This is why Mrs Suleelabai, co-founder of the Anna Theresa Women’s Development Society, a local not-for-profit organisation, took it upon herself to learn the essentials of making low-cost alternatives that can be produced at cottage industry level. She raised the necessary money from local business people and contributed her own time to buy books and participate in a practical training course on the subject. Her vision was to show others how to make pH-balanced soap, detergent powder and disinfectant liquids that would “kill all known germs”, yet be less harmful to the environment than branded products. As part of its post-tsunami programme, Transrural has sponsored market research in the district. 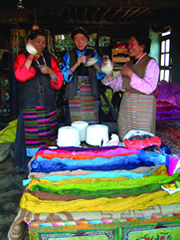 This shows that there is widespread demand for these products, that it is very price-sensitive due to low consumer buying power and competition, that there is a need for good local organisation, use of appropriate technology at village level, local branding, training in following strict safe practice guidelines, and effective promotion. The economics add up, as production costs are far lower and so the same strength of local cleaning material can be sold at roughly half the price of the internationally-branded product. Our initial market research highlighted an opportunity and a threat. The government of India has instituted a policy guideline to local government offices, advising them to purchase supplies from local self-help groups to alleviate poverty, in cases when it is practicable and cost-effective to do so. We were told of one case in which a group succeeded in securing approval to supply a small quantity of cleaning materials to the local government office. However, they were given to understand that approvals for further contracts would be much easier to secure if local officials were to receive “commission” payments – which would wipe out any potential net benefit to the producer. Such situations are not uncommon, and part of Transrural’s project is to advise and sponsor training on advocacy to help stamp out such practices. For the period 2010-2012, we are sponsoring training in technical skills and promotion, providing guidance on group organisation and managing a small business, offering matching grants for selected items of appropriate technology such as mixing machines, assisting with local packaging and presentation of the cleaning products, developing health and safety guidance, and fostering group savings and credit schemes to by-pass the money-lenders. Depending on the degree of success achieved among 300 “beneficiaries”, the experience will be shared with others in India and beyond in 2012, to encourage lesson-learning and replication.